For information on Sales and Prices of our remaining inventory, please refer to our Home Page. Below I left our original sales page for information purposes. Prices and Warranty are no longer valid. • Our original linerlock, the PIG gen2 is available for sale now! • We have also just finished a very limited run of Framelock Pigs. 1) Choose from the following options (take a look at some of the different options versions here). *Please note: we have had mysterious problems with our E-Mail. If you do not receive a reply within 24 hours, please try again by typing in the E-Mail address yourself. Two Wasp prototypes made their debut at the Blade Show in Atlanta. 10 were ready for sale in October at the Plaza Show in Anaheim, CA, but we found that some more changes were needed to perfect them, basically some slight modifications so they would fit larger hands more comfortably. Watch our website for more updates! Contact info at "info at RedBladeKnives.com" Red Blade Knives, a maker of fine custom folding knives. Made in the USA. Tactical Folders, Knives, CPM 154, CPM 3V, S30V, Titanium Liners, Textured G10 grips, military utility knife. If we have the knife in stock, we will send you an invoice and you can pay using your Paypal account, Credit or Debit Card. If we don't have the knife in stock, we will let you know when it will be available and put you on the waiting list. As soon as the knife is available, we'll conact you. Linerlock: The linerlock is the original knife that we started our business with. Any blade style or handle color for the same $500. Framelock: We have just completed what we call our "prototype run" of framelocks. It is the Pig on steroids! Same blade and spacer, but the liners and slabs are replaced with 1/4" titanium milled to conform to the hand - not flat like so many of our competitors. We have anodized a number of the handles in different colors, so you will have to conact us to see what is in stock. 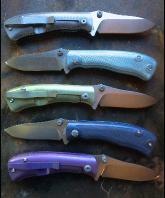 For this run, anodized or not, the knife retails at $950.